The Original Farmers Market once again rounds up a caboodle of vintage cars. 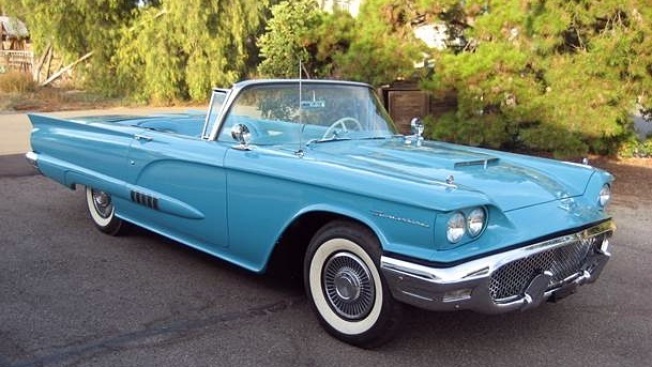 If your dad breaks out the projector, the one that's been sitting in the corner of the garage for decades, and loops up some reels from the 1950s, '60s and '70s, films he made at the beach and along PCH, you're going to be mighty blue if you don't see a convertible or two. But newsflash: You will. You'll see loads of them, because old-school convertibles and LA living went together like cocoa butter and inflatable beach balls around the middle of the century. And those cool retro rides are the modern focus of the 2016 Gilmore Heritage Auto Show, which will vroom into the Original Farmers Market on Saturday, June 4. There's no ticket or fee to enter, no sirree. You may simply park your own wheels and stroll among the 100+ "classic and vintage American cars," including several soft- and hard-toppers. "The Sky Is the Limit: A Tribute to American Convertibles" is, in fact, the 2016 theme. Can you get super-duper close, the better to admire the details along the dash and console? That's tradition at the 22-year-old gathering, and no one will tell you otherwise. Will there be a few celebrity cars in the bunch? Check it out: Petersen Automotive Museum, a nearby neighbor of the Third & Fairfax landmark, is providing a loaner for the day, and it is a true humdinger: It's a 1941 Cadillac Series 62 Coupe once owned by Clark Gable and Carole Lombard. Best bring a handfan to fan yourself, because that's a heart-thumper for both movie mavens and '40s-era car people also. Also, a handfan will come in handy because toasty temps will arrive with the autos. Which feels kind of right, since convertibles are the theme. No, not every car parked around Farmers Market or close to The Grove will be a '66 Ford Thunderbird convertible, or a Chevrolet Corvette convertible, but several will be, if cars that cool down via nature's air-conditioning are your pleasure. A 1939 Woody Teardrop Trailer will even make a cameo, the better to stoke all of those summertime, hit-the-road holiday daydreams. Again, this is free, as so many things at the vintage destination are, so you'll only need dollar bills for a hot dog or doughnut after your lookie-loo stroll-around. And if you want to see the Petersen, well, that requires admission, but hoo boy does it have some sweet and shiny works of art that happen to come with steering wheels, fenders, and engines. You could even walk there, if you want a good 20-minute walk, after your car-filled fun time at the Original Farmers Market.